The other customized keychain is a kind of practical keychain, not only as key ring, but also has other functions, such as bottle opener. 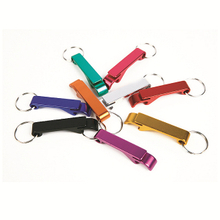 The metal keying with colorful bottle opener is made of zinc alloy, it is firm and durable, anti-rust and wearable. From the name of metal keying with colorful bottle opener, you can know that there are many colors to let you choose from. The bottle opener can open cap easily, keep handy on your key ring with your keys. The bottle opener won't occupy you many places, instead, it can help you find your key strings quickly. If you want a functional keychain, the metal keying with colorful bottle opener is a good choice for you. Of course, we also provide you with nail clipper with key ring. We guarantee product quality, please rest assured to choose your needs.